Released on Monday 4th March 2013. 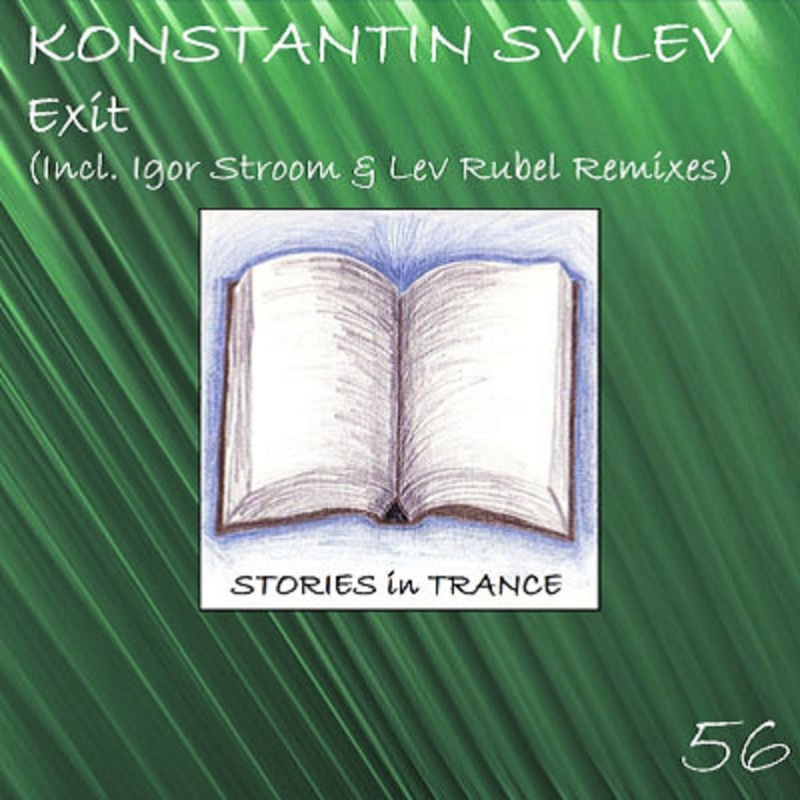 Stories In Trance is proud to present our 56th release and second original by Russian producer Konstantin Svilev with this three track single Exit. Konstantin made his debut for Stories In Trance on our Endeavour EP (SIT #51) with City and backed that up with his remix of Four Points' Bridgestone (SIT #52). He is on top form again with this techy and energetic original in the shape of Exit. An epic lead with pumping mids, this is a dance floor smasher. 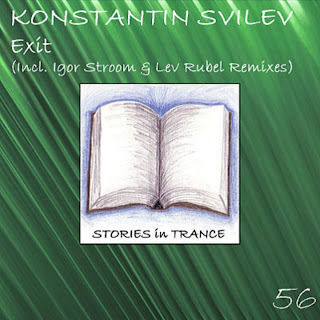 Be sure to check out more of Konstantin's work with us in 2013, another one of our discoveries we are happy to showcase on Stories In Trance. In second we have Ukraine's Igor Stroom with his offering. After his excellent debut with Radiant (SIT #36) and subsequent follow ups Hope (SIT #41), Aura (SIT #45) and The Sun (SIT #48), he then turned his hand to a remix with his sensational interpretation of Apollo (Relaunched) for our landmark 50th release. Igor once again shows why he is fast becoming Eastern Europe's most promising young producer. He infuses his trademark tech trance flavour to his remix and the production is yet again second to none, a must in any set or mix. The third version comes from another of our Ukrainian comrades, Lev Rubel. Lev made his production debut for Stories In Trance with Insomnia as featured on the Tibbs EP (SIT #44) in October 2012 then backed that up with Fairyland (SIT #53) and fantastic remixes of Ethereal (SIT #49) and Bridgestone (SIT #52). He once more proves his undoubted talent; a warm and delicate backing to the emphatic lead added to the excellent production technique makes this a track to savour. Lev is a producer to really keep an ear out for on Stories In Trance in 2013. Released Monday 25th February 2013. Stories In Trance is happy to present our 55th release by Markus with the four track single Smoke Of Glory. Up first we have the Radio Edit which is the bite size version of the Bismark remix; all the qualities of the full track in a shorter helping. The second track on the release is the Bismark remix which doubles as the original. Bismark (Marco Bisegna) was a key part in defining the legacy that was the massive Italian label BXR, along with Mauro Picotto, Gianfranco Bortolotti, Mario Piu and several others. The BXR philosophy is one that we are indebted to, as we emulate its eclectic range of productions and believe in strength through diverse releases. So it is an honour to have Bismark on Stories In Trance. He made his debut for us with his remix of Rominica (SIT #15) and he is back with his sound engineering wizard Andrea Tamashi alongside Marco Angelici to give us Markus. They deliver a progressive monster with a flowing melody infused with sumptuous mids and a deep rich bass generating a track with real atmosphere; this is truly stunning with production values second to none. Bismark is back and the trance scene is certainly a better place for it. Thirdly we have the fourth appearance on Stories In Trance from talented Hungarians Forenetix (Garry SJ & Peter) with their sublime version. Following on from their remixes of spArk's Clouds Come (SIT #17), Derrick Meyer's Final Goodbye (SIT #23) and Airborne Angel's Perfect State (SIT #24) they hit the mark once again with this excellent rethink. With their 'Airmix' presented here they stay quite close to the original's flowing lines and melody but craft a more uplifting feel which works perfectly with the incredibly versatile lead. This is first-rate evidence that talented producers can reinterpret each others' productions in many different ways. T Gate's Faith (SIT #8) and most recently Igor Stroom's The Sun (SIT #48) , as well as his collaboration with another of Stories In Trance's favourite producers Max Stealthy with Cloudburst (SIT #35). Once again he puts his unmistakable style on the original transforming it into a pure energetic and uplifting stormer. Using the unforgettable lead with his unique, powerful style, Vinganza once again produces a sublime slice of trance as it should be. Fabulous. Stories In Trance is delighted to present our 54th release. We give you White Motion with Come Inside. Stories In Trance favourite White Motion is back with his fifth original which this time out includes Soundwave and spArk remixes. Any follower of ours will surely know White Motion's vast and extensive back catalogue of tracks and remixes from the last couple of years, his most recent outings in the shape of original tracks Mind Station on Tibbs EP (SIT #44) and Bittersweet Memories on Endeavour EP (SIT #51). Yet again this is another production to enjoy; an elegant melody backed with beautiful and subtle mids combined to create a warm, well produced track. This is pure trance excellence, a sure fire hit in any mix or set. The second remix is brought to you by Italian Soundwave with his 'Uninvited' remix. Soundwave made his bow for us with his stunning 'Classic' remix of Airborne Angel's Belt Of Orion (SIT #19) and backed that up with two equally epic yet diverse originals; Last Moments features on the well regarded In Quarto EP (SIT #20) and Lost In A Dream (SIT #27) plus his most recent remix of Igor Stroom's Aura (SIT #45). Soundwave showcases his immense and diverse talent, expertly fusing his uplifting sound with a more techy progressive edge, masterfully crafting the lead amongst sublimely produced mids and bass. With such an evocative feel this is a winning remix and perfect advert for his talents. For the second remix we have Egyptian producer spArk. He made a fine debut with his original track Clouds Come (SIT #17) and followed that with his euphoric retake on Max Stealthy's Arrinera (SIT #25), setting the standard high for his follow up original in the form of My Freedom (SIT #37) which lived up to the expectation. This time he turns his hand to reinterpreting a more progressive track and takes it down his now signature uplifting style which works a treat. Energy, emotion, power and pace, this is everything trance should be and adds a fantastic slant on the original. Once again this shows the diversity Stories In Trance is proud to promote with our tracks and remixes and this is one to savour for certain. 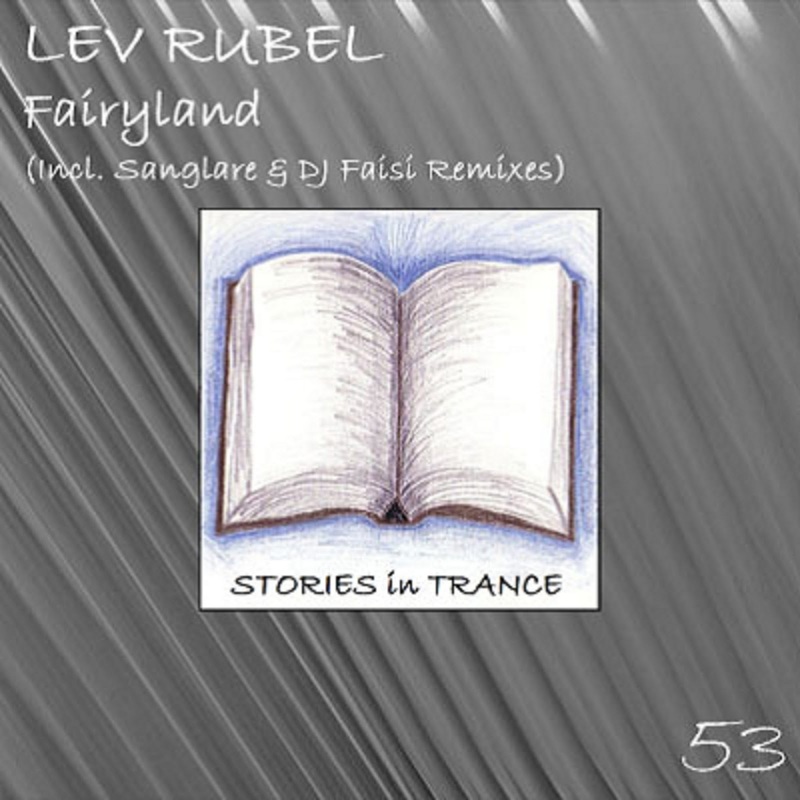 Stories In Trance are delighted to present our 53rd release and second original by Ukrainian Lev Rubel with the three track single Fairyland. Lev made his production debut for Stories In Trance with Insomnia as featured on the Tibbs EP (SIT #44) in October 2012 and backed that up with fantastic remixes of Ethereal (SIT #49) and Bridgestone (SIT #52). He once again proves his undoubted talents with the stunning Fairyland; a beautiful, warm lead melody added to the excellent production technique makes this a track to savour. Lev is a producer to really keep an ear out for on Stories In Trance in 2013. For the first remix we have Sanglare. They made their Stories In Trance debut with Faith In The Future (SIT #43) in the Autumn of 2012 and are back to turn their hand to a remix for us for the first time. A harder, darker take on the original combining energy and power with the unmistakable lead; a banging addition to this epic release. The second remix on offer is from DJ Faisi. Having taken some time out from producing due to other commitments, Faisi's last outing on Stories In Trance was back in April 2012 remixing Derrick Meyer's Final Goodbye (SIT #23). Now he is back with a bang with all the usual qualities we have come to love and expect from him, backing up the dreamy lead with fantastic Mids and bass, a truly great remix and superb addition to any set or mix. It's good to have DJ Faisi back. Available to download world wide from Monday 11th February 2013.